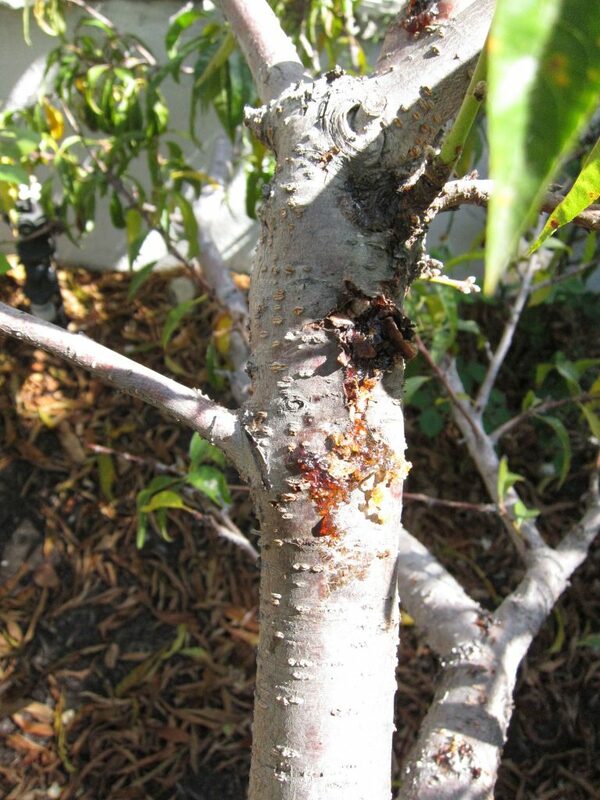 Today, I was reading California Rare Fruit Grower’s recommendations on how to take care of new grafts, and they warned that hot summer sun can damage young tree bark, so protect it using white paint, Kaolin clay, or bio dynamic tree paste. Any time I see “biodynamic,” I think of Rudolf Steiner, the father of the Biodynamic Method. To apply, scrub the tree’s bark, removing any scale insects, lichen, or loose material, and paint the bark with this mixture until it is well coated. In theory, the difference between this and the white paint or Kaolin clay is that it actually heals the tree bark or pruning cuts, fighting infestations and bacterial/fungal infections. Surgically remove cankers. Cankers should be removed, and (if possible) burned, buried, or moved out of the orchard. Cankers on trunks and large limbs can be removed surgically in mid-summer when trees heal most rapidly. Surgery should be performed in dry weather with a forecast of dry conditions for at least three days. During surgery, remove all diseased bark around the canker and about 1 1/2 to 2 inches of healthy tissue from the sides and ends, respectively. The problem is, the cankers often attack the oldest parts of the tree, including the trunk and main branches. The APS describes the best hygiene to prevent and deal with this condition. There is no known chemical or fungicidal application that provides satisfactory treatment. However, if anybody can cure a tree, it would be Rudoph Steiner and his biodynamic concoction of tree paste. Want to give it a try? To have your trees coated in biodynamic tree paste in Southern California, call Judy’s Homegrown. For large orchards, see this article from Applied Biodynamics. For a free Judys Homegrown handout about Fungal Infection of fruit trees, click here. This entry was posted in Uncategorized and tagged Apple, biodynamic, biodynamic tree paste, canker, cherry, cytospora, fungal infection, fungus on trees, leucostoma persoonii, nectarine, peach, plum, Rudolf Steiner, stone fruit trees, treatment for fungal infection of tree. Bookmark the permalink.